We meet some of the best people by accident! 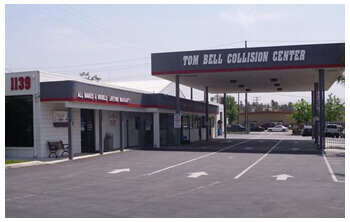 Tom Bell Chevrolet Collision Center has been providing collision repair for Redlands and the surrounding areas for over 30 years! Originally located at the Tom Bell Chevrolet location on Alabama St. in 1981, the Collision Center occupied a 4,500 square foot facility with only one spray booth and 7 work stalls. The shop expanded to a 11,000 square foot facility adding 10 additional work stalls in 1988. The Collision Center continued to grow occupying more and more of the Dealership property until October 2008. Becoming more than the dealership property could withstand, the Tom Bell Auto Group opened a 30,000 square foot stand alone facility with State of the Art Equipment where it currently stands today on Redlands Blvd. The new facility offers covered parking for our customers, a spacious lobby, 24 hour towing and courtesy shuttle. 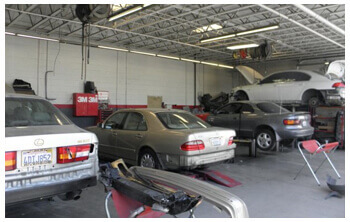 Our friendly, helpful staff is ready and waiting to assist you with all your auto body needs! Complete with 25 Stalls, 4 Frame and Unitized Body Straightners, Laser Guided Measuring Equipment, four spray booths and an Automotive Detail Center with over two acres of parking with easy Tow Truck Access. 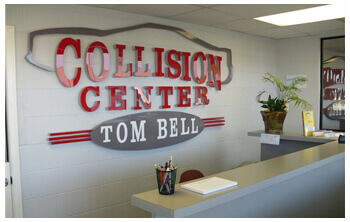 Tom Bell Collision Center knows accidents are stressful & inconvenient; Our Collision Center cannot prevent a mishap from happening, however we can help eliminate much of your resulting stress and get your vehicle back on the road quickly. Tom Bell Collision center is also a preferred provider for most insurance companies! Either way, Tom Bell has you covered! Give us a call at (888) 449-6285, e-mail us, or just stop on by at 1105 W. Redlands Blvd. in Redlands!